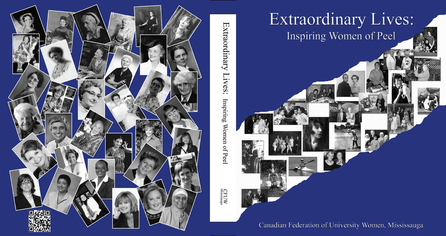 CFUW Mississauga (Canadian Federation of University Women) has published book of profiles on exceptional women of Peel County. Written by our own members, the fully illustrated book showcases the lives of 36 women, past and present, who have made outstanding contributions to our community over a 200 year period. These women have helped to shape or change the history of Mississauga. Peel County encompasses Mississauga, Brampton and Caledon and although it possible to locate where many of the historical women featured in the book lived, some place names have changed and the landscape has been radically altered, particularly in Mississauga and Brampton, by urban development and growth. Researching some of these stories has been an exercise in detection but, early in the project, a decision was made not only to include historical figures but also to showcase some of the very special women who are part of the contemporary landscape in Peel. The result is a book of thirty six illustrated biographies featuring a group of remarkable women who are all connected in the past or present to Peel County. Click here to view a slideshow of the women whose profiles are included in the book. The book will be an enduring historical record of Canadiana. Profits from the sale of the book will go towards post-graduate scholarships and fellowships for Canadian women through the CFUW Charitable Trust. CFUW Mississauga wishes to thank all those who have made this publication possible, including The Hazel McCallion Foundation for the Arts, Culture and Heritage. CFUW Mississauga will begin the celebration its 60th anniversary with the launch of Extraordinary Lives: Inspiring Women of Peel, at our first meeting on Monday, September 10th, 2012. Books will be delivered following the launch. On Saturday, September 29th at 2pm our first public event will be held at the Lorne Park Library Branch. Books may be purchased for $15.00 or two for $25.00. We will try to deliver the book to to those who have placed orders in Peel region. Outside this area shipping cost would be $8.25 per book. Multiple orders will be quoted on a individual basis. To view an article in the Mississauga News online , August 30, 2012 by John Stewart click here. In November the CFUW Mississauga, (Friends and Members who supported our book publishing) donated $3000 to the CFUW Charitable Trust which was used by the Trust to pay for the 2012-13 Creative Arts(music) Award. This award gives funds to a female student at the Banff Centre of Fine Arts. It gives the chosen women the opportunity to meet and work with some of Canada's top musicians of the day. It was felt that this was an appropriate choice as in 1955, shortly after receiving our charter had already been very active in establishing this award with a generous donation. What better way to celebrate out 60th Anniversary. Carol Hare,Chair of the Charitable Trust, and Susan Murphy, President thank the continous support that this club has given the program for education of graduate women. Congratulations to Anna Pidgorna, the recipient of the CFUW Creative Music Award. The Museums of Mississauga will be highlighting the book, Extraordinary Lives; Inspiring Women of Peel, running from February 13 to June 15, 2013 with an opening reception on Feb 13, 2013. Plans are in progress to set up the display and we have provided them with a copy of the book for the Museum's big fund raiser Feb. 22, 2013 to be part of the silent auction.